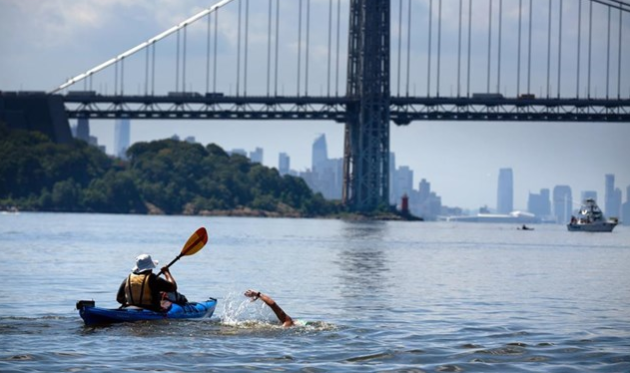 Diego López Dominguez, the fastest swimmer in the weekend of 20 Bridges Manhattan Island Swims described his 28.5-mile (45.8 km) circumnavigation of Manhattan Island. The native of the Canary Islands finished in 6 hours 37 minutes, the 11th fastest circumnavigation of Manhattan Island in history and the fastest ever by a Spanish swimmer. Diego López Dominguez: I felt great throughout. We started on Mill Rock by the East Side. The day was sunny and the Harlem River was flat and very entertaining with as many as 15 bridges which I passed swimming backstroke and counting out loud with my kayaker. The Hudson was somehow choppier, but currents were strong so it didn't feel too long until we reached The Battery. At that point, I started to have cramps and struggling with my feeds, but sighting the Brooklyn Bridge as we entered the East River, as well as passing swimmers - I had been the last one to start - was an energy booster. I also had a lot of support from back home and from other parts of the world, so it felt amazing to finish first in such a fast time. Daily News of Open Water Swimming: How did you train for this swim? Diego López Dominguez: I wake up at 5.30 am every morning to swim in the pool with the Bearcat Masters of New York before going to the office. On top of that, and given the cold waters of New York during winter, I have been traveling to different parts of the Caribbean Sea to take part in open water races between 4 km and 21 km since the beginning of the year. Daily News of Open Water Swimming: Was there any point in the swim where you slowed down due to oncoming current? Diego López Dominguez: According to the organizers, the currents around The Battery were strong and held me back for about 40 minutes, but I kept swimming and feeding according to my initial plan. Clearly, after swimming 28.5 miles in a little over six and half hours, currents is not something I will complain about. He raised money and awareness for the Ocean Recovery Alliance (see here).